In the CQ WW WPX CW contest 2016 I used two indoor cylinder dipoles. After I sent in my log for the CQ WPX, Terry N4TZ noticed my soapbox. 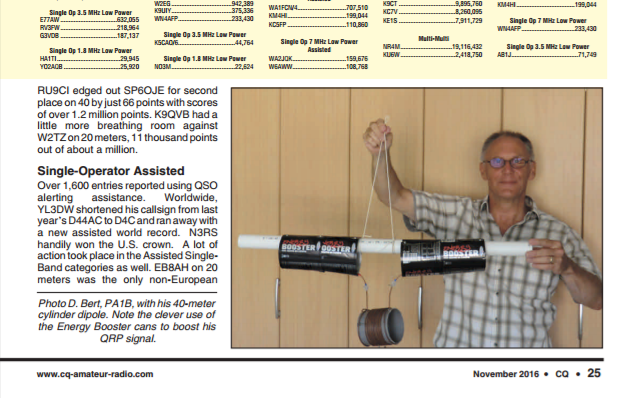 Terry asked my to send in a picture of my cylinder dipole to include in the write up of CQ Magazine. I thank Terry for the nice and beautiful write up. The CQ WW contests generate a lot of activity. I use contests to make QSO's with very low power. And. . it is good opportunity to test your antennas. The cylinder dipole shows a large capacity between the cylinders. Although the coil and the capacity are tuned to the band of interest, the cylinder dipole can be used as a multi-band antenna. Two taps at the center of the coil provide a low impedance feeding point to connect the twin lead. Match for a SWR of 1:1 with your symmetrical tuner. Energy Booster cans or not, a cylinder dipole will radiate better than a wire dipole of the same length. Thank you, Terry for the very nice write up. 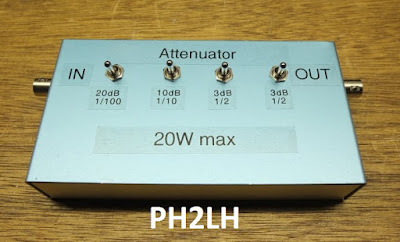 This beautiful attenuator is designed and built by Lex PH2LB. 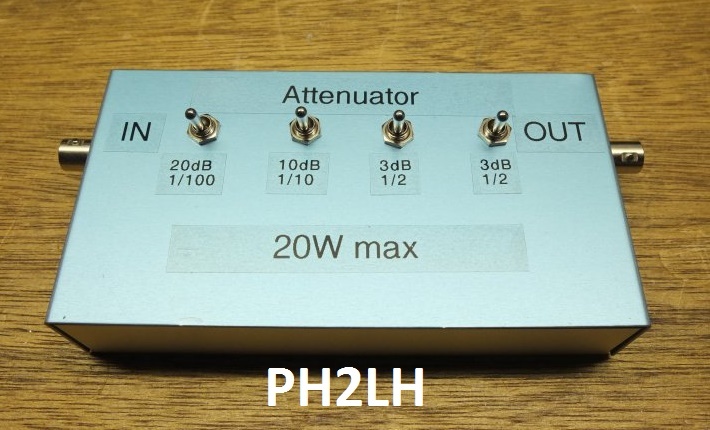 The attenuator can handle a maximum power of 20 watt and is used to reduce the power of a 5 watt transceiver. 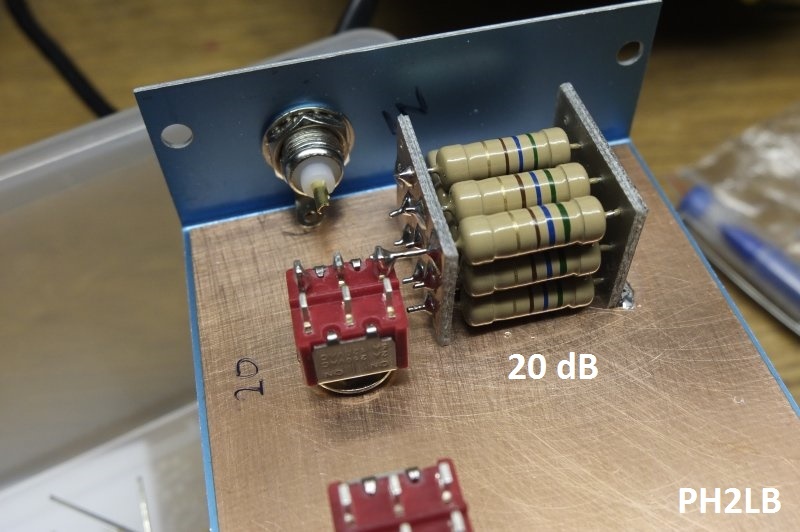 At first I did not realized why Lex designed the attenuator for 20 W. Like many HAMs I thought, that 20 W is QRO. But please notice that 20 W is the Maximum power. The chosen maximum power of 20 watts for the attenuator is an excellent choice. The attenuator can easily handle a power of 5 watts, without getting hot. This was an eye-opener for me. hi. A resistor that dissipates its maximum power will get very hot. So it is good practice to choose the maximum power 4 times higher then the continuous power. Lex choose for a maximum power of 20 watts, to reduce a power of 5 watts. The resistors have a maximum power of 2 watts. With a power of 1/4 of the maximum power, the resistors will dissipate about 500 mW each and they will not get hot. 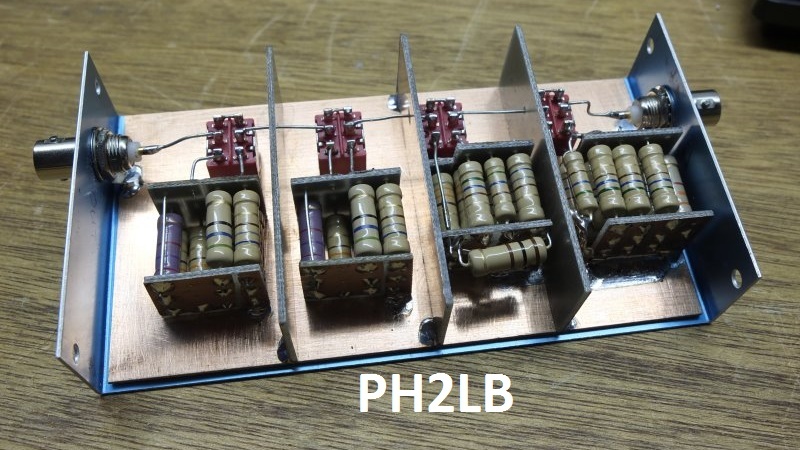 Visit the article on the 36 dB attenuator on the web site of Lex PH2LB. 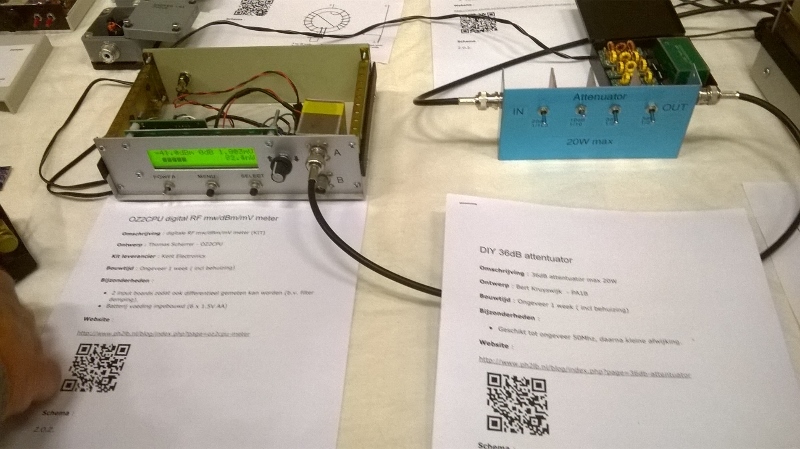 Lex used the PA1B Power Attenuator Calculator to design his 36 dB attenuator for 20 watts. This unique spreadsheet in Excel calculates the number of resistors and the values of the resistors from the E12-series for an attenuator section. In the picture below I show the input values for the section of 20 dB, for a maximum power of 20 watts, that is built with resistors of 2 watts. Just download the PA1B Power Attenuator Calculator and play with the values. The calculator has no restriction on the power. Last week I visited the HAM convention 2016 - Dag voor de Radioamateur 2016 in Apeldoorn. 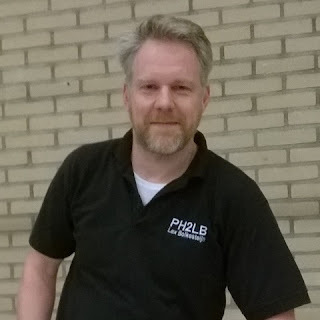 I was very pleased to meet Lex PH2LH. When I approached the stall of Lex, I immediately recognized the 0 - 36 dB Attenuator that Lex has designed and build. Further Lex showed the beautiful build OZ2CPU digital RF mW / dBm / mV meter.